This is why I get so exercised about WebIDL and the way it breaks the mental model of JS’s “it’s just extensible objects and callable functions”. It’s also why my discussions with folks at last year’s TPAC were so bleakly depressing. I’ve been meaning to write about TPAC ever since it happened, but the time and context never presented themselves. Now that I got some of my words out about layering in the platform, the time seems right. ECMAScript is not fully self-describing. Chapter 8 drives a hole right through the semantics, allowing host objects to whatever they want and more to the point, there’s no way in JS to describe e.g. list accessor semantics. You can’t subclass an Array in JS meaningfully. JS doesn’t follow it’s own rules, so why should we? DOM is just host objects and all of DOM, therefore, is Chapter 8 territory. Many of the Chapter 8 properties and operations are still in the realm of magic from JS today, and we’re working to open more of them up over time by giving them API — in particular I’m hopeful about Allen Wirfs-Brock’s work on making array accessors something that we can treat as a protocol — but it’s magic that DOM is appealing to and even specifying itself in terms of. Put this in the back of your brain: DOM’s authors have declared that they can and will do magic. Ok, that’s regrettable, but you can sort of understand where it comes from. Browsers are largely C/C++ enterprises and DOM started in most of the successful runtimes as an FFI call from JS to an underlying set of objects which are owned by C/C++. The truth of the document’s state was not owned by the JS heap, meaning every API you expose is a conversation with a C++ object, not a call into a fellow JS traveler, and this has profound implications. While we have one type for strings in JS, your C++ side might have bstr, cstring, wstring, std::string, and/or some variant of string16. JS, likewise, has Number while C++ has char, short int, int, long int, float, double, long double, long long int…you get the idea. If you’ve got storage, C++ has about 12 names for it. Don’t even get me started on Array. It’s natural, then, for DOM to just make up it’s own types so long as its raison d’être is to front for C++ and not to be a standard library for JS. Not because it’s malicious, but because that’s just what one does in C++. Can’t count on a particular platform/endianness/compiler/stdlib? Macro that baby into submission. WTF, indeed. 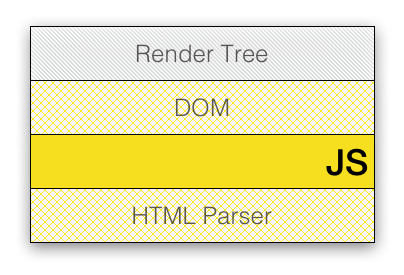 The parser, DOM, and rendering system are browser-provided, but they’re just JS libraries in some sense. With <canvas>‘s 2D and 3D contexts, we’re even punching all the way up to the rendering stack with JS, and it gets ever-more awkward the more our implementations look like the first diagram and not the second. 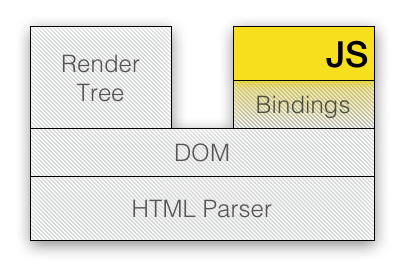 To get from parser to DOM in the layered world, you have to describe your objects as JS objects. This is the disconnect. Today’s spec hackers don’t think of their task as the work of describing the imperative bits of the platform in the platform’s imperative language. Instead, their mental model (when it includes JS at all) pushes it to the side as a mere consumer in an ecosystem that it is not a coherent part of. No wonder they’re unwilling to deploy the magic they hold dear to help get to better platform layering; it’s just not something that would ever occur to them. Luckily, at least on the implementation side, this is changing. Mozilla’s work on dom.js is but one of several projects looking to move the source of truth for the rendering system out of the C++ heap and into the JS heap. Practice is moving on. It’s time for us to get our ritual lined up with the new reality. The network is our bottleneck and markup is our lingua-franca. To deny these facts is to design for failure. Because the network is our bottleneck, there is incredible power in growing the platform to cover our common use cases. To the extent possible, we should attempt to grow the platform through markup first, since markup provides the most value to the largest set of people and provides a coherent way to expose APIs via DOM. Markup begets JS objects via a parser. DOM, therefore, is merely the largest built-in JS library. Any place where you cannot draw a line from browser-provided behavior from a tag to the JS API which describes it is magical. The job of Web API designers is first to introduce new power through markup and second to banish magic, replacing it with understanding. There may continue to be things which exist outside of our understanding, but that is a challenge to be met by cataloging and describing them in our language, not an excuse for why we cannot or should not. The ground below our feet is moving and alignment throughout the platform, while not inevitable, is clearly desirable and absolutely doable in a portable and interoperable way. Time, then, to start making Chapter 8 excuses in the service of being more idiomatic and better layered. Not less and worse. This entry was written by alex, posted on April 4, 2012 at 7:49 am, filed under openweb, programming, standards, webdev. Bookmark the permalink. Follow any comments here with the RSS feed for this post. Both comments and trackbacks are currently closed. As we have plenty of other things to work on, such as documenting a whole part of the platform not documented to date, adding new features as we go and requested by developers, and we already had OMGIDL from our predecessors, Web IDL is not all that weird and actually solves a very large number of problems we have been having. In terms of behavior at the binding level not being well defined. I guess the other thing I said last time and might be worth repeating, is that you cannot fix this by shouting from the sideline “fix this”. No army is needed, but like everyone we are constrained, and the ideas put forward so far have all had their share of issues and nobody so far has taken the time to address them. new HTMLDivElement() might be nice, but new HTMLElement() does not work the same way. You suggested somewhere we should make tagName writable then, but that would have to change the underlying class and has other implications that are not thought through. Sorry to mis-represent. Fixed above. I’m a huge fan of getting everyone talking more. The world-view disconnect is strongest amongst the folks who are forced to sit in the same room least often. IIRC, I was only one of two or 3 folks from TC39 at TPAC at all. That’s pretty bad. Anyway, I’m not trying to stone WebIDL to death, only to identify a waypoint on our journey that’s some distance beyond what it’s giving us. DOM prototype linearization is *huge*. But it’s just the start. And yes, I want DOM’s concerns to weigh ever more pressingly on TC39 (why don’t we have events/futures/promises/collection types/etc. in JS yet? “DOM needs them” should be a statement that carries serious weight). Perhaps we can arrange a meeting this summer. First, you don’t need to specify behaviors for every constructor. I’m really flummoxed why we keep getting hung up on this. First pass, just specify what happens for all the concrete types and omit arguments; do the abstract types and constructor arguments second and third if it’s so hard (and it’s really not, just have that ctor be a no-op until we define the lifecycle). Making things callable by default is really just step one, and these things can be done in steps. Removing the magic one layer at a time is *doable*. But it’s only going to happen when it’s a priority. As for tagName, we need some invariants preserved…but what are they, really? You need tagName to be fixed by the time you appendChild. That is to say, it needs to be a non-configurable, non-writeable own property when the element is attached. That ties the identity of the object to the observable tag name, and that’s not terribly difficult to say in JS. Object.getOwnPropertyDescriptor(el, “tagName”) can tell you everything you need to know. As for the lifecycle, we’re actually defining most of what you’d need in Web Components. There’s stuff left to define about how attributes are actually stored (MSFT got this right in their DOM but lost the battle…sigh) and how types from markup will be coerced. But again, if you don’t take any arguments to the ctor to start with, you side-step the problem in the first phase of the transition. Thanks for the thoughtful manifesto! I’m pretty much with you about avoiding magic in our APIs, though I can’t really get worked up about the constructor issue. Where you lose me is the markup-first policy. I don’t see how that helps for APIs that are not related to document content. My view is that the open web platform has grown bigger than HTML. In my layer diagram, the bottom layer includes the HTML parser, but also the underlying hardware and OS, and has boxes for network, filesystem, audio, graphics, vibration, telephony, etc. There’s still a nice solid yellow band of JS above that layer, and then a layer of “HTML5” APIs above that, but only one of the boxes in that third layer is the DOM. This is not true. tagName needs to be fixed when the object is created because it determines the interface. Hrm, that interface guarantee might be needed for the built-in element types (who can fix their tagName early in their constructor), but I’m not sure I understand why that’s need for other element types, particularly custom ones. I guess it’s sort of a litmus test: caring about consistency with the language idioms is something you do or don’t have. The way I phrase the question to our API designers here is “what was your thinking about HTML when you were designing this API?”. If they haven’t thought about it, go back and do it again. HTML isn’t something you can just put to one side, it’s how you get users. It can’t be an add-on. I don’t want to derail too much from the main point of the post, which I full agree with, but I did want to at least make a note. DOM was originally created during the Netscape/IE browser wars, but this stuff was non-standard and typically referred to as DOM Level 0. The standard, Level 1, was released by the W3C in 1998 about the same time CSS 2 and XML were released as standards. The original specification for DOM Level 1 was originally created for XML only and then simultaneously regressed and expanded for HTML support at recommendation time. I say regressed because HTML syntax has always been and continues to be far more sloppy than XML, so assumptions have to be made when HTML is parsed. I also say expanded because DOM support for HTML contains additional properties that have no relevance in XML. While you’ve described a relationship between HTML/DOM/JS that is *technically* correct in the context of today’s browsers (the very best kind of correct! ), you’ve made the common but critical mistake of conflating what is with what should be. I know all of the history — I work on a browser for chrissake — but you’ve gone all schema-tron on this and forgotten that this isn’t about abstract descriptions, it’s about providing power for people who need it to get a job done. I could go on and on, but suffice to say, you’ve clearly articulated the antithesis of my views. I will point people at your comment in future when they ask me what people who don’t want good layering in the platform could possibly be thinking. Yeah, that’s difficult, probably harder than any of the current efforts to reimagine the web browser. It’s tearing down and rebuilding a key part of the stack rather than tacking on new pieces. Both APIs would have to coexist for a long time, as the DOM would not go quietly. At the same time, though, I suspect that developers are already doing this work, and suffering because they have to do it as an extra layer on top of broken pieces. I have found that when working in HTML alone that I save incredible amounts of time when I develop only in XHTML 1.1, because the browser tells you where your errors are. There is no guess work and most of the wisdom of my professional experience in trying to identify bad form is now automated by the browser. When I am complete I can relax the document back to HTML 4 or XHTML 1 for compatibliity, and many accessibility and semantics problems are solved already without trying. Challenges are removed and costs are reduced by pushing the largest cost challenges to the front of development. What I find strange is that most companies and software projects think like this internally. They tend to solve the hardest problems first so that their software will be more stable over its lifetime. Strangely enough even applications dedicated for use on the web, such as web browsers, tend to think this way. Unfortunately this sort of disciplined business acumen is thrown away when speaking of web technologies. The typical wisdom is that people need to be empowered. If you would not think this way in your strategic software planning then why would it make sense to think this way about strategic application of web technologies? In my mind people are generally better empowered when a given environment’s costs are reduced and complexity absolved. In your HTML rendering stack, it may be nice to explicitly call out on the stack the browser plugin layer. When I think “scripting the browser” I think “Browser Plugin”. When I think “Scripting the Page”, I think “JS with associated bindings”. Am I correct in thinking that you want both in the same place? Perhaps you missed the work that Erik Aarvidson did on the Dart DOM? An idiomatic standard library is the birthright of any language worth a damn. In that spirit we’re doing Web Components and have driven changes to DOM already (element.find(), prototype linearization, etc.). The ugly truth is that only JS and Java constrain themselves to an IDL when starting on their APIs. WebIDL’s detractors are right to hold it up as a primary stumbling block to progress on this front. We certainly thought about an IDL um…never (except as a description shorthand) when designing dart:html.